Coloradans were warned that there may be snags with the new health care exchange that opened today as part of the Obamacare implementation, but perhaps it was worse than predicted. 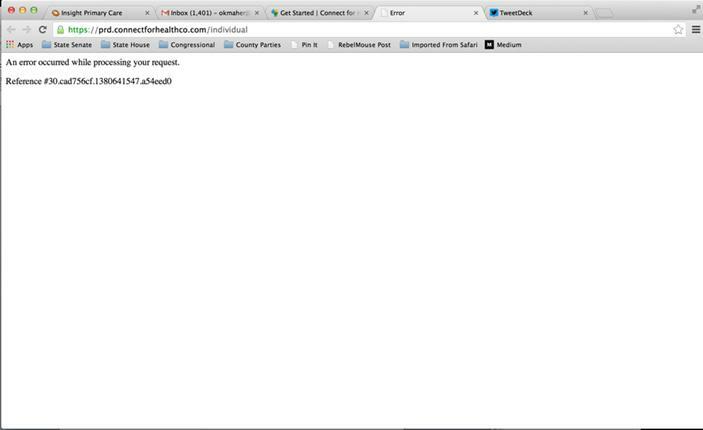 Several people today tried to sign up for the new health care exchange, dubbed Connect for Health Colorado, only to find that basic functions of the site, such as “create a new account” were not working. In fact, the exchange tweeted that it was shutting down the create an account feature to fix the error messages. To ensure a smooth shopping process, we are temporarily turning off the create account function to resolve some error messages. Of course, this is kind of like when your boss calls to yell at you, you hang up on him, and lean back in your chair and smile thinking that you’ve resolved the problem. Would-be enrollees were warned earlier this week that the tax credit estimator may not work, but were told that they should be able to enroll. No tell me this isn't so! Just like Obama care a cluster F**k!